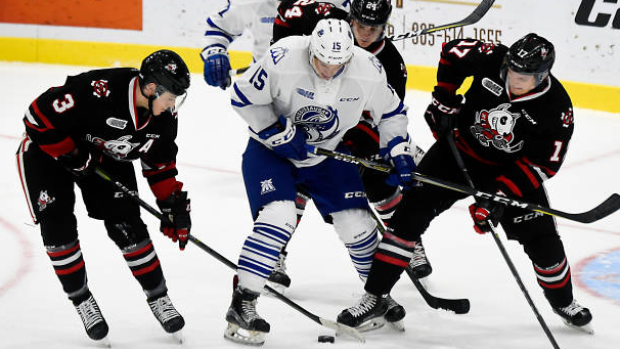 A law firm hired by the Ontario Hockey League concluded that the Niagara IceDogs breached the league’s player recruitment rules by entering into a secret “side deal” with a former player, according to a court decision obtained by TSN. On Feb. 15, the OHL announced the IceDogs would be fined $250,000 and lose two first-round draft picks as a penalty for undisclosed recruiting violations. On March 15, the IceDogs filed an application in Ontario Superior Court in Hamilton asking a judge to set aside those penalties until a claim by the former player regarding an allegedly unfulfilled contract against the IceDogs could be heard in an arbitration hearing. The player, whose name has been redacted in court documents, has alleged that the IceDogs agreed in a secret side deal to pay him thousands of dollars for every year he played with them but reneged on the agreement. That IceDogs’ application, along with an affidavit sworn by team owner Bill Burke, has been sealed by Justice J.A. Ramsay, the judge overseeing the case. In a decision delivered the same day, Justice Ramsay rejected the IceDogs’ application. “If the IceDogs wish to pursue a remedy in the courts for the decision of the commissioner, they should first exhaust the remedies available to them by virtue of their membership in the league,” Ramsay wrote. Justice Ramsay’s decision also reveals that the OHL began an investigation into the IceDogs in May, 2018, after the former player emailed OHL commissioner David Branch with a complaint. After receiving the former IceDogs player’s claims, the OHL hired a law firm, which investigated the claims and delivered a report to Branch in June of 2018. “The investigator concluded that the Ice Dogs had made the alleged unwritten deal,” Justice Ramsay’s decision says. Branch accepted the law firm’s findings and decided to sanction the IceDogs. It’s unclear why Branch waited for eight months after the delivery of the report to issue the punishment. In an emailed statement to TSN, Branch declined to elaborate on the matter and wouldn’t say whether the OHL’s investigator had concluded the secret side deal was an isolated incident. "The League will be issuing a statement on our League website concerning this matter in due course," Branch wrote. Neither a lawyer for the IceDogs nor a team spokesperson responded to emails requesting comment. Niagara isn’t the first OHL team to run afoul of the league’s recruiting rules. In 2012, the Windsor Spitfires were fined $400,000 and stripped of three first-round and two second-round draft picks, although the financial aspect of the penalty was later reduced to a $250,000 fine. The business operations of the IceDogs have been under scrutiny for several years as a group of former players have sued the OHL for back pay, arguing that major junior hockey players are employees and should be paid at least minimum wage. Denise Burke, who owns the IceDogs alongside her husband Bill, testified in a Nov. 14, 2015, affidavit that while her OHL team brought in an average of $2.7 million in revenue in a season, it was a frequent money loser because annual expenses typically ranged between $2.7 million and $2.9 million. “We knew that we wouldn’t become rich owning a team, but seeing as this is our only business, we have always hoped that we would at least be able to break even and at least make more money than we spend, otherwise sooner or later the ‘Bank of Burke’ will run dry,” Burke testified. Her affidavit did not address any side deals the team has allegedly struck with players. According to a copy of the IceDogs' tax return, the team also has leased four BMWs, including a $121,000 BMW X6 M.